According to Todd, Hill is “the Ultimate Expert in Real Estate“. Hear it for yourself! 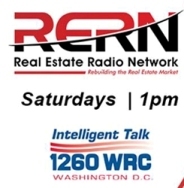 You can play the full radio show that was broadcast on Saturday, September 6, 2014 on the Real Estate Radio Network, WRC 1260 AM. Click on THIS LINK for the hour-long show. During the first 10 minutes, Hill, Jim Musgrave, Financial Advisor with Research Financial Strategies, and Todd discuss real estate investment, REITS, first time home buyers, moving up, renting a prior home instead of selling, becoming a landlord. and safety concerns for agents and homeowners. See the VIDEO of Hill’s Interview segment (14 minutes) later in the show at the YouTube link (CLICK HERE) or see the video below. Todd asks Hill during his interview: What buyers and sellers really want to know when they ask, “How’s the market?”; How he keeps current with changes in the market so he can best help his clients; Local market trends and statistics; What is going on in Charles County, Montgomery County, DC, and Northern Virginia; How the Internet can mislead and is confusing and overwhelming buyers and sellers; The need to have a professional agent to educate clients and provide authoritative data; The skills needed for negotiation; How Hill coordinates 40-50 participants in a transaction; Sales contract changes; Global marketing through Christie’s International Real Estate; and What makes the unbeatable combination of WC & AN Miller/Christie’s/Long & Foster stand out among Washington area brokers — (Unsurpassed Client Support).